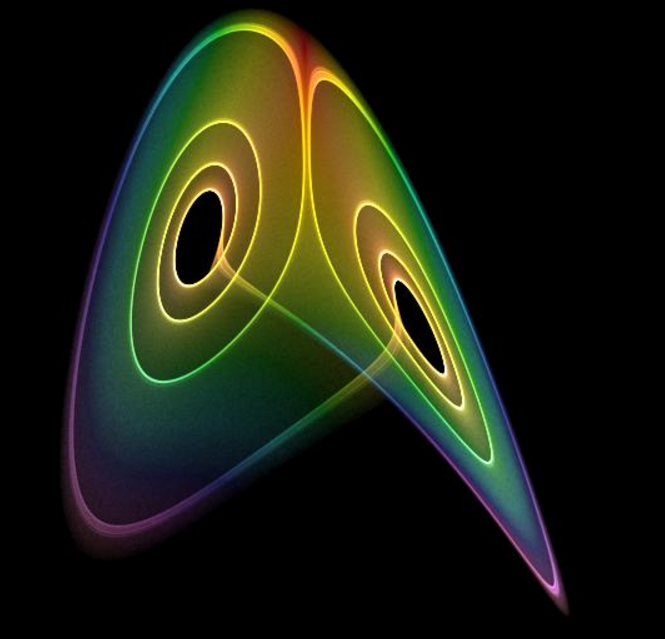 Climate and the Lorenz attractor, 3D interactive model. In my previous post, I described some recent blog discussion of chaos and climate models (GCMs), and gave my views on the relation to Navier-Stokes solution and CFD. People who write about chaos tend to focus on the trajectories, and their touchy relations to starting point, claiming this undermines GCMs. They should instead focus on the attractors, which are independent of start point sensitivity, and are the analogue of climate. And I contend that attractors have a manageable relation (see Appendix for math) to parameters that may vary - forcings for climate, or coefficients in a chaos differential equation. A trajectory for the standard Lorenz parameters σ=10, β=8/3, ρ=28. Often displayed without mentioning that specific parameters are required. An attractor (due to Anders Sandberg, Oxford) parameters not specified but seems close to standard. The general idea is that you can compare the effect of changing start points, with comparison red/blue trajectories, and also see the very great range of different attractors that result when the parameters are changed, However, the changes are continuous. What I'd like to get to eventually (future post) is a possible relation between an average of trajectories and the attractor. That would help understand how GCM runs can be averaged to get a climate evolution. There has been a flurry of skeptic blogging (and commentary from me) on chaos and climate models. It's generally along the lines that chaos renders GCMs unworkable because of small changes magnifying or some such, with words like coupled and non-linear. Kip Hansen has a series at WUWT, finishing here. Like many such, it shows the Lorenz trajectories produced by a set of three slightly non-linear equations. I'll develop that with a gadget to explore these curves and their attractor in a future post. Tomas Milanovic has one of an intermittent series of posts (latest "Determinism and predictability") at Climate Etc, of which the general theme is the unsolvability of Navier-Stokes equations due to some effect of non-linearity negating proof of existence and uniqueness, or some such. My standard response to all this is, look at Computational Fluid Dynamics (CFD, which has been my professional activity for the last thirty years). It is a major established engineering tool based on numerically solving the Navier Stokes equations, and has dealt with the chaos (turbulence) from the beginning. And the climate models are just large scale CFD. There are certainly difficulties with the solution, mainly to do with the necessary sub-grid modelling (in both CFD and GCMs). But they aren't to do with the fact that the solutions don't relate to initial conditions. In fact, that is a benefit, since initial conditions are hardly ever known accurately. And the theoretical issues of existence and uniqueness etc don't impinge on practice. Algorithms are used which generate solutions on a gridded or meshed space with time stepping. These solutions satisfy on that scale the conservation laws of momentum, mass and energy, which are also expressed by the N-S equations. If you find such a solution, it doesn't matter whether it's existence could be proved in advance. As for uniqueness, the solution procedure itself will generally indicate whether different solution pathways are possible. One CFD scientist, David Young, has been objecting that some recent work, in which he has a part, does show non-unique solutions. But as far as I see, this is in situations like near-stall on a wing, where reality itself is far from predictable. The CE post had an odd answer to this - yes, CFD works, but only on a scale of up to a few metres. This is of course unphysical - there is no such restriction on the physical laws, nor in the discretised algorithms is any physical scale limitation built in. And of course, GCM's are just Numerical Weather Prediction (NWP) programs, run for longer periods. Most sensible people concede that these work quite well, despite the many km scale. What people who like to show fancy chaos pictures rarely dwell on is the nature of attractors. These are what distinguish chaos from randomness. And they are typically the results that are sought from CFD analysis. In CFD, initial conditions are usually just a nuisance (because you rarly have good data, and when you try and specify them, there is usually something that will generate unintended disturbances). The standard remedy is to run the program for a while to let these settle out. This takes advantage of the fact that initial conditions are swept away in chaos. GCM's do the same. They typically "wind back" to start at some time well before the period of interest. This would be bad if initial conditions mattered, because data back then is less reliable. But it isn't bad, because they don't. Again, it is better to let artefacts settle before the solutions are needed. This lack of concern with initial conditions in a search for attractors, relates to the frequent criticism of GCMs as predictors. GCM's find out about climate (attractor), but don't predict the trajectories that converge to them (weather). That relates to the initial condition issue - models can only generate trajectories that are possible in the circumstances, not ones that will reproducibly happen. GISS is down from 0.97°C in August to 0.91°C in September. This compares with a larger fall of 0.12° in TempLS mesh, and contrasts with the small rise in the NCEP/NCAR index. It is still the warmest September in the record (just ahead of 0.90°C in 2014). It really hasn't cooled since May, and a record hot 2016 is ever more likely. As I mentioned in the TempLS post, the dominant effect on recent changes is Antarctica. TempLS rose strongly in Aug, and dropped in Sep; GISS responded in the same way, but to about half the extent. I expect NOAA and HADCRUT to be less affected again. The Moyhu TempLS mesh index fell in September to 0.736°C, down from from 0.855°C in August. That still makes it the hottest September in the record. TempLS grid fell 0.04°C fro 0.785°C to 0.744°C. The recent ups and downs mainly relate to Antarctica, which was very cold in July, very warm (relatively) in August, and about normal (on average) in September. TempLS mesh followed this closely, while TempLS grid regards a lot of Antarctica as missing values, and so downweights the changes. This is reflected in the other indices - GISS and BEST rose like TempLS mesh, while NOAA (0.05°C) and HADCRUT changed mush less. I would expect GISS to also drop this month, but NOAA and HADCRUT maybe not. In terms of regions, there isn't much unusual outside Antarctica. Siberia, Europe, E US and Alaska fairly warm, with just Australia on the cold side. I can vouch for that, though we were on the fringe of the cold region shown. With other indices, UAH lower trop was steady, while RSS rose by about 0.1. All seem set for a record warm 2016. On housekeeping, Google says they are looking into the blogroll issues - still out. The map is below the jump; report at the data page here. The Moyhu NCEP/NCAR index rose in September to 0.475°C, up from 0.428 in August. This brings it back to about the level of May. There was then a drop to June, followed by a gradual increase to now. This seems to be associated with ENSO-neutral conditions. And as usual recently, it was the hottest month of its kind in the record. Next month will test this trend of records, since Oct 2015 was very warm. On other matters, I apologise for the absence of blogroll, search etc. Apparently Google Blogger has recalled them for repair. I'm told they should reappear soon.